The Security Bra, combines sensual elegance with practical personal security features. Utilizing ultra-sonic and micro-computer technology, the bra constantly probes the wearer's immediate frontal vacinity, detecting approaching persons or even static objects within an 8 foot range. Aesthetically, the garment recalls the high-modernist torpedo bras familiar (although covered by other garments) in popular culture from Natalie Wood's first performance with James Dean in Rebel Without a Cause; to the famed silhouette of Lieutenant Uhura in the Star Trek series. It emits audio beeps and led flashes, which speed up as a stranger approaches, similar to devices used to detect a hostile presence by Sigourney Weaver as Ripley in the Aliens series. The Security Bra is a garment capable of returning the male gaze and electronically defining ones personal space. The rate of its beeps let the offending party, nearby persons and most importantly the wearer herself know the exact proximity of such an intrusion. Components of the garment include: The bra itself, black silk, with plastic boosters; twin mini sonar speakers; twin mini speakers and red l.e.d.s at the summit of each breast; a matching belt-pack containing twin circuit boards powered by a 9 volt battery. 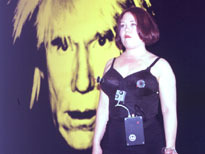 Shown here modeled by Jolie Para at the Andy Warhol Museum, Pittsburgh March 20, 1998.